ISABELLA ALLEN grew up on a twenty-five acre property in Texas, where she still lives with her parents, older sister, younger brother, and rescue mutt, Paisley. She developed a love for animals and exploring at a very early age, but her real adventuring didn't start until she started venturing deeper into the property with her younger cousin as a teenager. 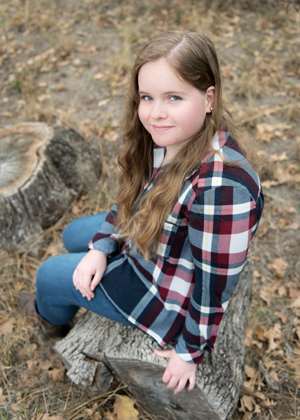 Isabella was inspired by all of the amazing things they discovered and decided that one day she would take more people "through the barbed wire and on an adventure!" by writing a book. Her experiences became the foundation for the Wild at Heart Mystery Series, and Isabella’s debut title, Through the Barbed Wire, reflects the journey that led her to become an author. CYNTHIA MEADOWS, a native Texan, draws and paints on anything she can find. Whether it was cartoons on the sides of her homework in elementary school, paintings as Christmas gifts, murals on walls, or illustrations and storyboards for advertising agencies, she has continually decorated the world. Cynthia's desire to look inside characters is the reason she loves to illustrate children's books, to create characters, and to give the reader a positive, often humorous view of life. Did you always want to be a writer and how old were you when you first started creating stories for others to read? When I was about eight years old I was very specific about what books I wanted to read. I would make up a book in my head and scour library after library looking for it. I never found anything close to what I was looking for. Through the Barbed Wire was one of those books that I looked for, but couldn’t find. So, I decided to take matters into my own hands and write the books myself. I’ve wanted to be a writer ever since. Do you feel like Isla shares similar traits to you? Which ones? Oh yes. We’re both wild at heart, shy, love animals, hate shopping for clothes, adventurous, and prefer the secluded country over a bustling city. Your protagonist is someone who overcomes living with dyslexia. Tell us why you decided to incorporate this aspect into your character and why it’s important. I’ve always loved creating characters who overcome unique, often overwhelming challenges. In middle school, I was often picked on for being small, quiet, slow, and at the time, having a thyroid disorder. I was also plagued with social anxiety, and I would actually practice talking before class, because I was afraid I’d forget how to speak! I remember daydreaming about proving ‘them’ wrong. So, I decided to give Isla dyslexia, as well as a speech impediment, not only because I related to her in having a disability, but also so my readers could relate to her in that way. I think it’s important that Isla deals with dyslexia and other difficulties, because I want to show kids that they can do amazing things, regardless of their disabilities. What is the message from this book that you hope readers will relate to and inspire them? That your trials in life don’t define you. We all struggle with something, but you can still accomplish incredible things and even overcome these struggles. I also want to teach readers not to judge someone based on the way they appear.